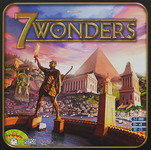 Description: You are the leader of one of the 7 great cities of the Ancient World. Gather resources, develop commercial routes, and affirm your military supremacy. Build your city and erect an architectural wonder which will transcend future times.